CNP – Technology Water and Biosolids, a division of Centrisys Corporation in Kenosha, Wisconsin, recently supplied the Howard County Department of Public Works with the patented CNP AirPrex process. 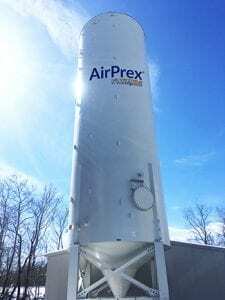 AirPrex, scheduled to be operational during the Q3 2018, will improve the current biosolids processing facility by sequestering phosphorous and preventing the formation of phosphorous scale known as struvite. Howard County Department of Public Works engaged HDR to provide engineering design services for upgrades to the biosolids facilities at the Little Patuxent Water Reclamation Facility in Savage, Maryland. The Little Patuxent facility used dewatered cake lime stabilization for biosolids treatment. The changes to the biosolids processing included eliminating the lime system and replacing it with anaerobic digesters, centrate demmonification and associated solids screening, thickening, odor control and digester gas handling improvements. After an extensive evaluation of phosphorous removal technologies, the design was based on AirPrex because of its demonstrated ability to prevent struvite precipitation in downstream processes, including piping and the solids dewatering equipment. The Little Patuxent facility uses decanter centrifuges for biosolids dewatering.The AirPrex process is a patented phosphorus recovery technology owned by CNP. AirPrex reduces problematic struvite buildup in wastewater treatment plants improving overall plant efficiencies, including dewatering improvements resulting in significant operational cost savings for treatment plants. AirPrex’s flexibility was another factor in the design. The process either sequesters struvite, leaving it in the biosolids stream for land application on farm fields as fertilizer, or recovers struvite, separating it from the biosolids stream. Once separated, the struvite can be used as a beneficial slow-release fertilizer. 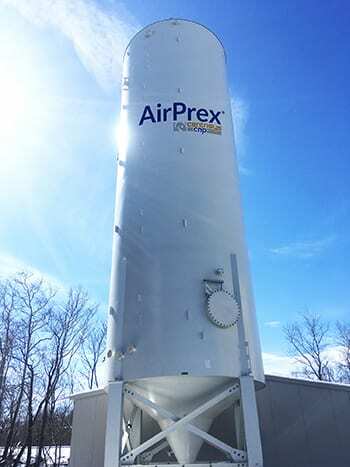 Howard County selected the Construction Manager at Risk (CMAR) delivery method for the construction of the upgrades and installation of AirPrex. Clark Construction, the CMAR contractor, negotiated with Kershner Environmental Technologies, the local CNP representative, on behalf of the county to procure AirPrex. The Little Patuxent Water Reclamation Facility is a 29 MGD advanced wastewater treatment plant using enhanced nutrient removal processes to reduce nitrogen and phosphorous discharges to the Chesapeake Bay. The facility serves 56 percent of the county’s 317,000 population. CNP – Technology Water and Biosolids designs and supplies nutrient recovery and biosolids treatment optimization systems. CNP’s key technologies are: AirPrex® and CalPrex™, phosphorus recovery technologies, and PONDUS™, a Thermo-Chemical Hydrolysis Process (TCHP). 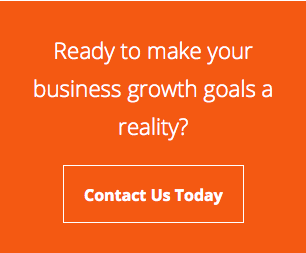 CNP is a division of Centrisys Corporation. Centrisys Corporation is a U.S.A. manufacturer of dewatering centrifuges, sludge thickeners and complete dewatering systems for municipal and industrial wastewater. The company’s focus is centrifuge equipment, including the award winning THK sludge thickener. Centrisys provides global service, repair and parts for all brands of centrifuges.